Lyndel has drawn and painted all her life and was encouraged by and took lessons from her artist father Harry Thomas who was a past student of Archibald Colquhoun. Because of her love of chiaroscuro she decided to study with various respected teachers in the ‘Atelier method’ from the school labelled ‘The Tonal School’, in Melbourne. 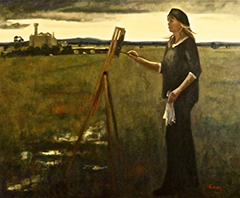 She also studied painting at Monash University for a short while. 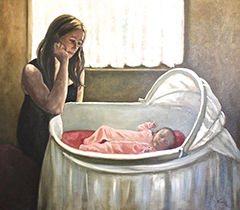 The light, mood and poetry of the subject is what she aims for. She is also very excited by symbolism and is working on bringing this element into her work. She majored in sculpture with a credit at the Ballarat University, School of mines in 1999. She ran her own Studio/Gallery/School in Daylesford in the 90’s where she held classes. Her paintings and sculpture were on constant display to the public. She is a member of the Associazione Acquerellisti Faentini, Italy . 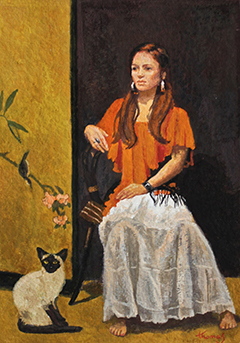 Her work has been exhibited in many group exhibition’s both in Australia and overseas. 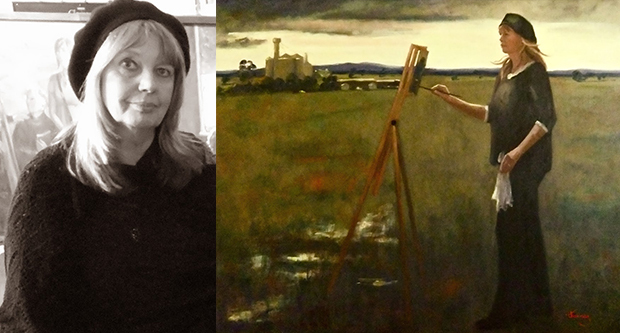 Past galleries are Spectrum Gallery, Balwyn, Williamstown Gallery,Melbourne, Pantechnicon Gallery, Daylesford and presently Heron’s Gallery in Castlemaine. Her media are Oils, Gouache, Pastels, Drawing media and Ceramic Sculpture. Experimenting with gouache is becoming increasingly important to her. 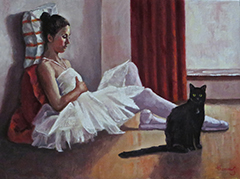 Lately Lyndel has been concentrating on exhibiting in Europe and she is working for a solo exhibition in Verona, Italy in June 2016 along with other European showings of her work. Her love of Europe and travel are a big influence on her work. She has won many awards for both her painting and sculpture and her work is held in private and public collections in Australia, Europe, U.S.A, Canada, New Zealand and India. 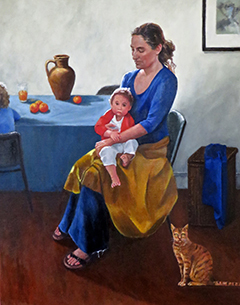 Two of her paintings are held by the Skopelos Foundation of the Arts collection in Greece. Her last major awards and selected exhibitions were presented in Italy [The Sandro Botticelli prize, Florence – also represented in Rome, Venice, Palermo, Noto and Lecce] She has also been selected to exhibit in France and Austria. [The Carousel Du Paris 2015, France and the Galerie des Carmes, Toulouse, France, 2016 along with “The Magic Art Wonder” in the MAMAG Modern Art Museum, near Vienna, Austria.] 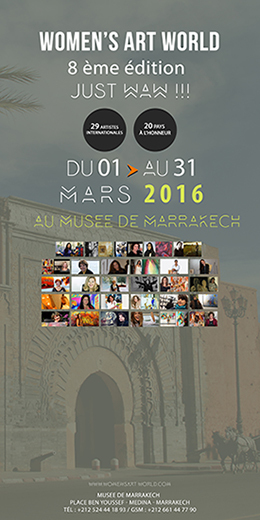 She has been selected to exhibit at the Museum of Marrakech, Morocco in March, 2016. Public collections in Australia are held at the RSL, Footscray, Victoria and The Latrobe Regional Hospital, Traralgon, Victoria. The most important thing to Lyndel is the act of creation! Life is art and art is life! Animal welfare is also extremely important to Lyndel and she tries to be a voice for them where she can.